Grant Kuhlwein (middle) fires a shot on goal for Washington during a non-league match against Ross Southeastern Thursday, Sept. 6, 2018. 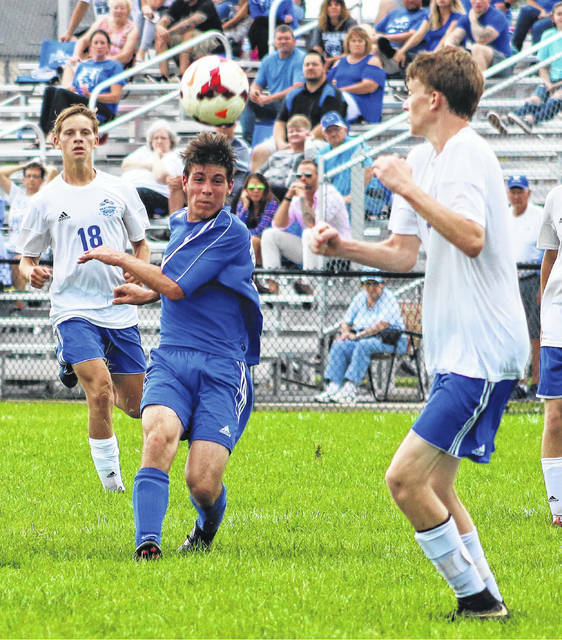 The Washington Blue Lion varsity soccer team took the field in search of their first win of the season Thursday night against the Blue and White Panthers of Southeastern High School (east of Chillicothe). Washington scored the first two goals, only to see Southeastern tie the game by halftime. Southeastern took a 3-2 lead in the second half, but Washington scored the equalizer. The Blue Lions’ first goal was by Grant Kuhlwein with the assist to Blaise Tayese. Tayese scored from about 25 yards out on a direct kick to put the Blue Lions in front, 2-0. “We were in control of the game at that point,” Washington head coach Aaron Teter said. “Our defense hadn’t made too many stops and our midfield was winning it for us. “But, things changed after that,” Teter said. “We kind of lost a little bit of our (momentum),” Teter said. “They scored two goals in the last 20 minutes of the half. “At halftime, we were excited, because we had been leading the game, which hasn’t happened this year,” Teter said. “At the same time, we were somewhat dejected because we had just given up two goals in a row. “We had a nice cross with about 17 minutes left in the game,” Teter said. “Blaise hit the ball on the left side, crossed it with his left foot and Ethan Smith jumped as high as he could and he headed the ball above the goalie and into the net. Garrett DeWeese had eight saves in goal for Washington. Washington (0-5-2) returns to Frontier Athletic Conference play Tuesday at Jackson at 5 p.m.